This month, Beacon Hill Partners is excited to host another exciting installment of Startup Stir. 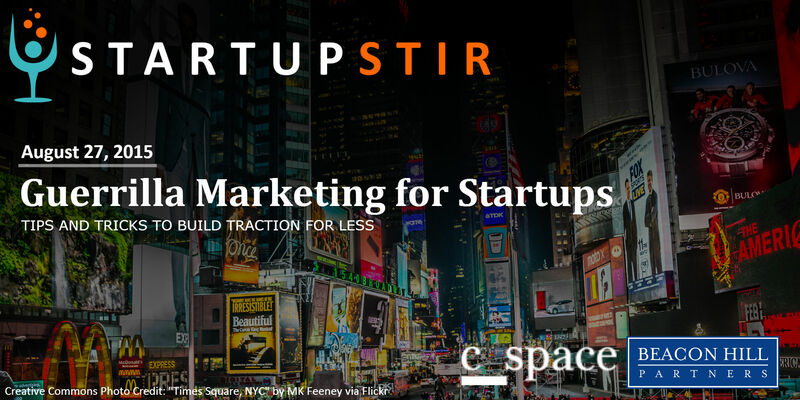 On Augut 27th, we’re hosting some of Boston’s most innovative marketing experts to talk about gaining traction with a limited marketing budget. You’ll meet marketing directors from UBER, MassChallenge, members of the startup community and Inc. Magazine marketing columnist Larry Kim. Sip in style with Mad Men inspired cocktails from Angel’s Envy bourbon. From 6:30 to 7, we’ll enjoy complimentary libations as we hob nob with founders, investors and academics. From 7 to 8, we’ll sit down at the beautiful C Space offices to get a dispatch from the front line of the Boston innovation community from the movers and shakers who are making it happen.